Tonight we have a beer that I have been looking for in Australia ever since my initial Alphabet Challenge that eventually spawned this blog. The letter "X" was always going to be one of the most difficult letters to get hold of and Xingu Black Beer was one I thought I might be able to find. Back then I was unable to find it, but now I have and so I'm going to share it with you. Interestingly it's the first Brazilian beer that's been reviewed on Beer O'Clock Australia. This will be the second time I will have tried it, having first had it last year in Estonia of all places! Xingu is also the first Schwarzbier I've reviewed in almost 2 and a half years! Anyway enough blog stats, it's time to drink this! Not surprisingly for a Schwarzbier (German for Black Beer), Xingu pours a very dark colour. It has a deep red, almost mahoghany, colour to it when held up to the light. The head is quite a dark colour for the style with head being a unusual khaki colour. The head last for quite a long time and laces the glass very well. In the Xingu "X" shaped glass it's an impressive looking sight. 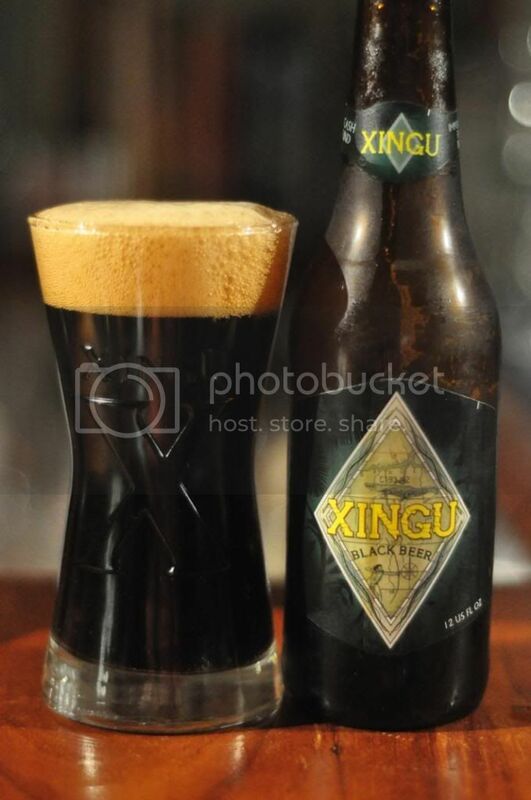 Xingu Black Beer has a really unusual nose for the style. Initially it's got quite a light feel to it, with grassy hops surprisingly prevalent. As it warms though there are darker aroma's that come through with roast, dark chocolate and dark fruits (maybe plums) all noticeable. The end of the nose actually reminds me quite a bit of Black Forest Cake, which could imply the dark fruits are cherries... Anyway nice enough nose. This Brazilian beer has a flavour that I didn't expect after smelling it. Initially it was mostly sweet caramel malts with very little of anything else. As it warmed there was a nuttiness that I had not detected on the nose, before the dark fruit flavours kicked in. The roast aroma was nowhere near as strong in the flavour department and overall I thought the mouthfeel was a little thin and didn't match the flavour. Having been looking out for this beer for so long it was always going to be anti-climatic when it came to tasting it. I think saying that I've also judged this beer a little harshly. The beer was not what I expected but it is not as disjointed as my review might make it out to seem. I'd recommend giving it a go if you come across it. it's not particularly expensive and there aren't that many Brazilian beers available in Australia.